A.J. Oishi's calm and peaceful paintings are created by compiling thousands of small dots. The circular designs that are common throughout her work symbolize individuals and their journey towards a more healthful, conscious life. A full bullseye represents a completeness within an individual. A.J. has consistently sought out knowledge, education, and points of view that would better her own self-growth. Her bullseyes symbolize the imperfect completeness that she believes most people are searching for. In her most recent work, A.J. began breaking up her bullseyes. This new non-standard shape that remains is significant in that she has come to realize that all individuals have certain components of themselves that can be let go or removed. In doing so, a more conscious way of living can emerge. 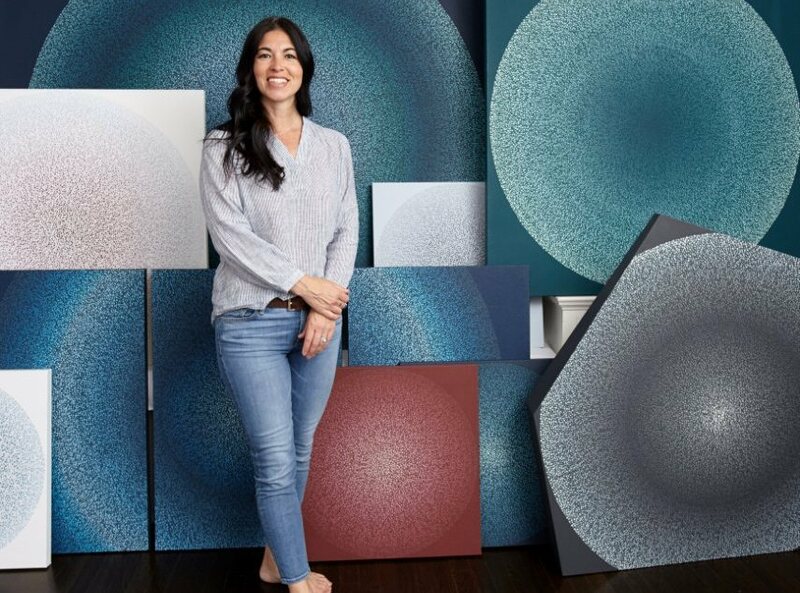 All of her paintings are driven largely by color. She is inspired by everything that surrounds her, and attempts to recreate combinations of color in her paintings. Each color inspiration exudes a certain emotion for her. As the piece progresses, A.J. 's challenge is to maintain that emotional "vision" while adding more color, and ultimately translating that emotion to the viewer, simultaneously telling the story of the individuals that are symbolized.